Summertime for most means more sunshine, adventures, pool days, beach time — and, unfortunately, extra summer breakouts. Why do we break out in summer more than other seasons? As temperatures rise, so does our oil and sweat gland activity. They are working overtime to keep our body temperatures cool. 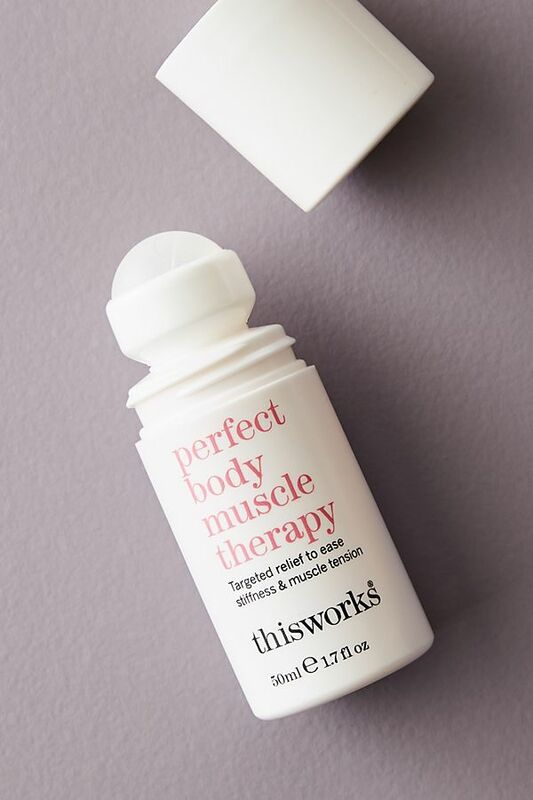 Add in extra sunscreen applications and longer days spent outside in the elements, and you’ve got yourself a recipe for a summer breakout. 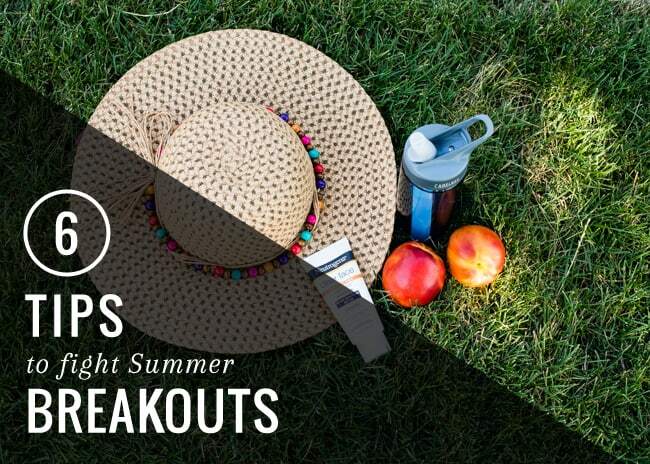 I’ve put together a few tips and tricks for combating breakouts in the summer. Never reapply sunscreen over makeup. It’ll clog your pores. Carry makeup removing wipes or rinse off your makeup before reapplying sunscreen. Or even better, try summer out as a makeup-free season! You might grow to appreciate your natural complexion and you may be surprised how clear your skin will get without foundations or powders. Carry a wide-brimmed hat with a high SPF with you or in your car at all times. Hats with a built-in SPF work even better than sunscreen at shielding harmful UV rays. And they won’t clog your pores on hot and humid days. Keep hydrated with water! Keeping yourself internally hydrated is a great way to signal to your sweat glands that they can chill and you’ve got your internal body heat under control. Wash your face immediately after exercising. Instead of keeping the sweat, dirt and oil on your skin, try to cleanse your skin soon after a workout. Eat plenty of fresh fruits and vegetables. Take advantage of all the fresh produce available during the summer season. Fruits and vegetables are fantastic for fighting pimples. Switch up your normal product routine. 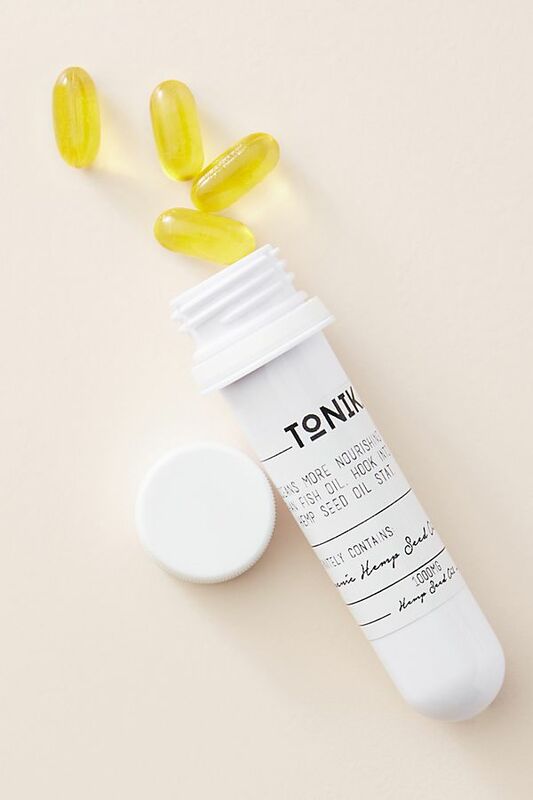 The moisturizer you used all winter long will most likely be too rich and heavy for summertime. Swap it out for a lighter moisturizer, even oil-free if you are constantly battling breakouts. Sometimes acne is inevitable, even if you do follow every tip and try your best to keep your skin clean and clear. 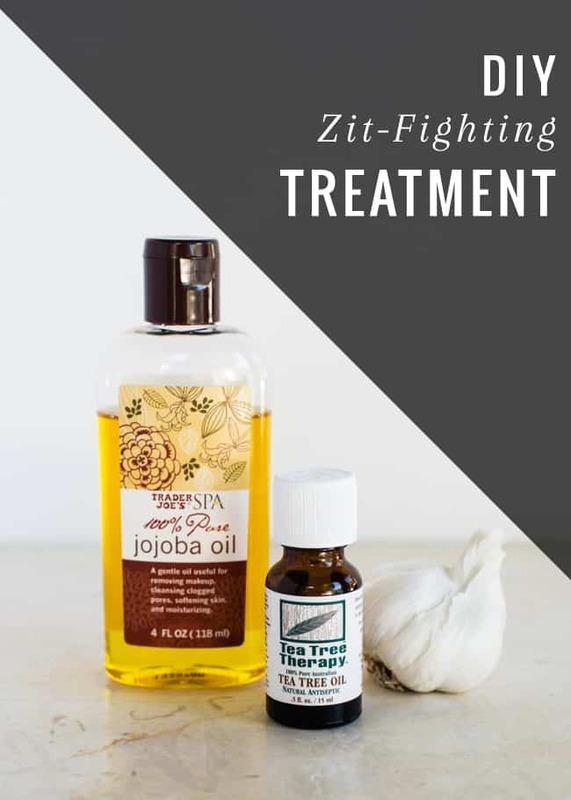 This homemade zit treatment is great for those occasions. Jojoba oil is known for fighting the production of excess oil. 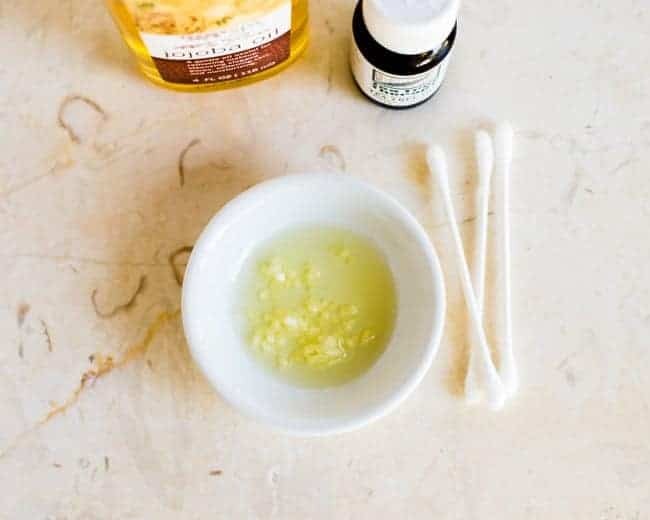 Garlic is both antibacterial and anti-inflammatory, and tea tree oil is antiseptic, antibacterial, and it reduces redness and inflammation. I have the tea tree oil and garlic but not johoba oil. Would it work the same without this? Hi Mary, you’ll probably need something to dilute the tea tree oil, so I would look into getting another oil to do this so that it’s not too potent on the skin. Love this! 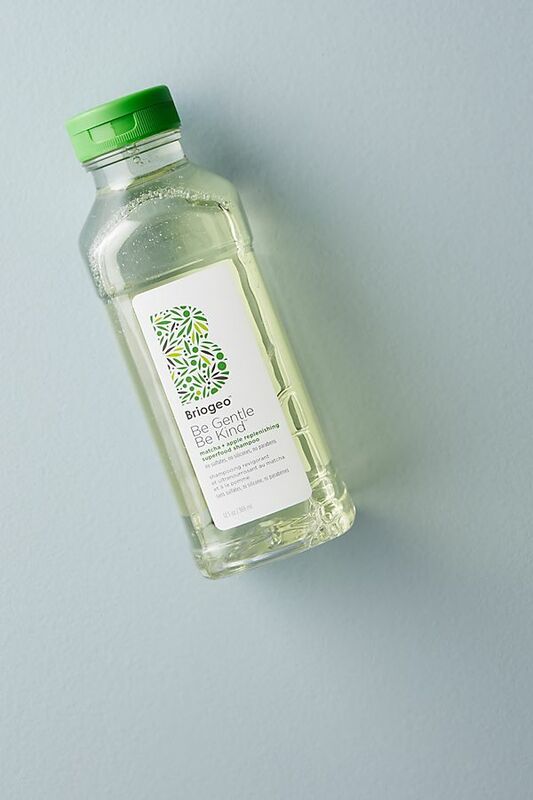 Thanks for sharing this :) tea tree oil has always been my go to product. Works in an instant! I definitely want to try the jojoba oil. My skin produces way to much in summer! This sounds great, I do want to point out that garlic will burn your skin so please don’t leave it on, least of all overnight! Garlic has amazing bacteria fighting powers, and I take the supplements but putting on pure garlic WILL burn and leave your skin scarred and black (speaking from experience). So please be careful when leaving the garlic on overnight. Yes! Give it a try. Oil isn’t always necessarily a bad thing, and moderation is always good too. Hopefully it’s helpful for you. Being makeup free (with a few exceptions) in the summer is one of my favorite things. My skin always looks so much better! Same here Stacia! I love it and it helps my complexion so much.